Everyone talks about using social media to connect with their customers and fans and engaging in deeper relationships and conversations. When meetings are done and it’s time to put the work, time, and energy where the buzzwords are, few companies are doing it, and even fewer are doing it well. One company who is doing it well is Starbucks. There are several elements to Starbucks strategy and in this article we’ll take a look at some of them. My Starbucks Idea is consumer portal where Starbucks customers can share ideas or suggestions they have about how to improve “the Starbucks experience”. While I’m not a coffee drinker, understanding and acknowledging that Starbucks is more than a cup of coffee is a key part of the equation. If you are going to charge premium prices, the experience is part of the price, and more importantly it’s Starbucks point of differentiation. Lot’s of people have ideas about how they can make Starbucks better, but the key to succeeding is figuring out which of these ideas will make it better for their existing customers, and help them acquire new ones. My Starbucks Idea takes the concept of crowd sourcing and opens it up to any customer willing to register. This also gives end users the ability to see what other people are suggesting, vote on ideas they agree with and even see the results. 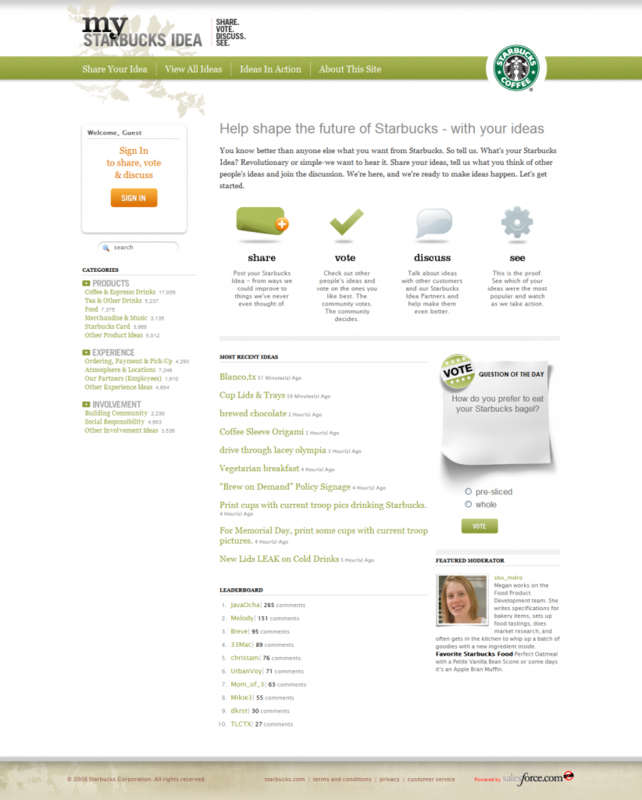 Starbucks Ideas In Action Blog acts as a counterpart to the My Starbucks Idea website. This site is written by different Starbucks employees and talks about how they implemented, or are reacting to the suggestions and information from customers. An interesting aspect of this blog is comments are enabled, many company news/policy blogs don’t have comments. However by turning on blogs and being open to that second level of feedback Starbucks is able to continue the dialog with their customers. 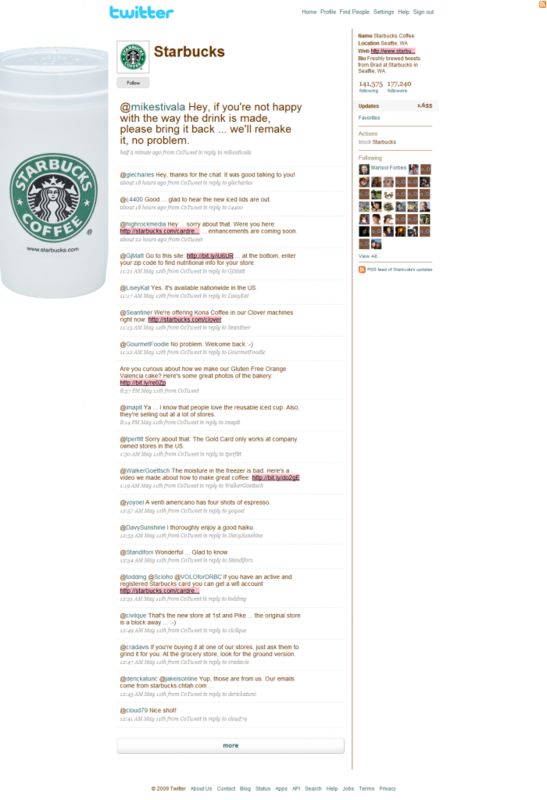 Everyone involved in social media in 2009 has a twitter profile, and Starbucks is no different. The account handles direct and indirect customer issues and complaints, talks with customers who engage them and announces any news. There’s nothing deep or insightful about the account, but it opens up a channel for Starbucks customers who prefer to use twitter as their method of communication. They currently have over 177,000 followers. Looking at one of Starbucks competitor Dunkin Donuts (http://twitter.com/DunkinDonuts) you can see a real difference in style, which probably accounts for why Dunkin Donuts only has 20,000 followers. Starbucks has chosen to allow these videos to be embedded, many companies don’t take this route, fearing their videos will be seen on sites they might not want to be associated with. While that is a genuine concern I’ve found that more often than not allowing embedding gets much more positive exposure than negative exposure. One area that could be improved is by interacting and favoriting and featuring fan videos, this is a strategy that works well for Will it Blend. Starbucks has a profile on Facebook. There not much here that isn’t seen elsewhere in any of the Starbucks social media efforts, but it does help Starbucks reach it’s customers who prefer Facebook over other social media websites. One of the only areas Starbucks as a company has ignored is Flickr. There are quite a few fan groups such as Starbucks, and Starbucks Coffee. Two of the more interesting groups are Starbucks Tour with photos of all the exteriors of Starbucks and 2 Starbucks which has photos that have two visible Starbucks in a single picture frame. Starbucks has a very effective marketing strategy. It uses many social media sites to reach out their customers and get their feedback and suggestions about their services. 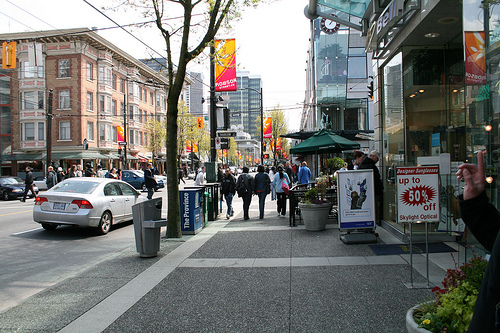 People love to go to Starbucks because Starbucks is active on suggestions and feedback of their customers.